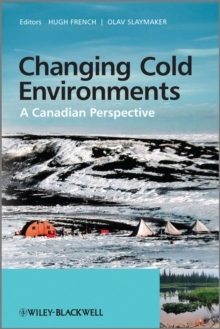 Changing Cold Environments; Implications for Global Climate Change is a comprehensive overview of the changing nature of the physical attributes of Canada's cold environments and the implications of these changes to cold environments on a global scale. The book places particular emphasis on the broader environmental science and sustainability issues that are of increasing concern to all cold regions if present global climate trends continue. Clearly structured throughout, the book focuses on those elements of Canada's cold environments that will be most affected by global climate change namely, the tundra, sub-arctic and boreal forest regions of northern Canada, and the high mid-latitude mountains of western Canada. Implications are considered for similar environments around the world resulting in a timely text suitable for second and third year undergraduates in the environmental or earth sciences courses.